Rift Basin Resources (TSX.V: RIF.H) announced its downlisting to the inactive company NEX board in a press release on August 13, despite remaining very active in pursuit of opportunities in Indonesia. The back-story is like something out of a Rudyard Kipling novel, with various intrigues and jockeying for influence over what may prove to be a substantial near-turn-key producing oilfield. The bottom line is this: if Rift Basin can pull all the moving pieces together and retain a carried interest for bringing this project to its strategic partners, the potential for a win for non-risk-averse investors is very real. 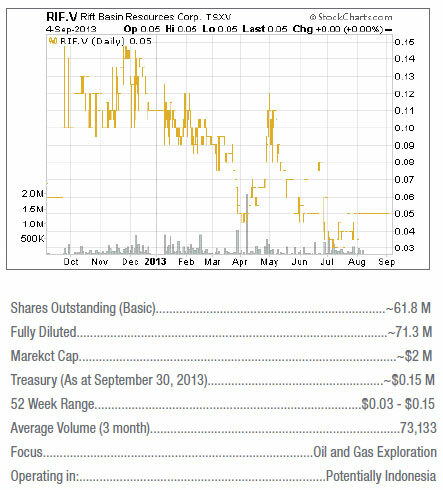 Current management took over the company, then called Mayen Minerals, as a shell just one year ago. It quickly completed a $1 million private placement and entered into a farm-in agreement to acquire a Tunisian asset known as the Chorbane prospect, a promising asset in partnership with London-based Gulfsands Petroleum. The stock saw a high of $0.15 but was subsequently beaten down to three cents as the months progressed and the deal remained unclosed. By April it was apparent Rift Basin was more focused on East Asian opportunities, and was distancing itself from North Africa. Rift Basin spent most its money but ultimately failed to complete the requirements to seal the deal on Chorbane. But that would appear to be a blessing in disguise, as domestic unrest in Tunisia is rising since the flashpoint of the Arab Spring toppled legacy dictators and installed a new democratically elected government who have failed to elevate the nation from deep and persistent poverty. The reality is that sectarian violence is ratcheting up big time in Syria, Egypt, Iraq and Tunisia, not to mention in the Sudans. So getting out of Chorbane was ultimately a fortuitous development, and Rift Basin's management was quick to recognize the changing dynamics and turn towards more compelling opportunity, something larger companies just can't do. Back on November 16, 2012, the company announced that it had "established a strategic alliance with Gulfsands Petroleum plc (LON:GPX)". The intention of the Strategic Alliance is "to facilitate the pursuit and acquisition of petroleum projects in Tunisia and elsewhere in the Middle East and North Africa region for mutual benefit." Back then, Gulfsands had about $104 million in the bank and was aggressively looking to replace their Syrian production currently in "force majeur", and so with the demise of Rift Basin's interest in the MENA region, where will the partnership strategically cooperate? 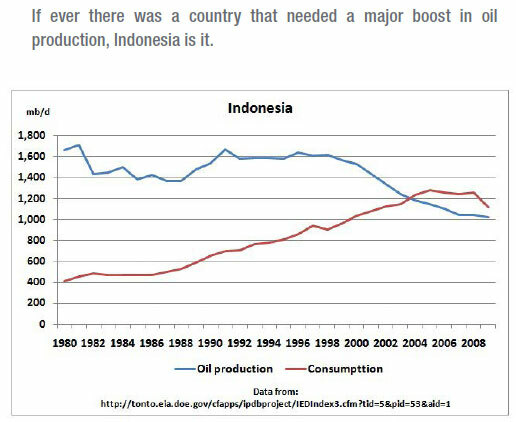 The answer is potentially Indonesia. On June 5th, 2013, Rift Basin announced that it had executed a non-binding Memorandum of Understanding ("MOU") with PT Sinergi Wijaya Kusumah, an Indonesian entity with certain rights to exploit hydrocarbon resources on East Java. "PT Sinergy holds the exclusive rights to exploit an onshore multi-reservoir oil field known as the Dandangilo & Beji Block, containing 110 existing wells within an 80 sq.km. area (the "Field"), located in Bojonegoro, East Java, Indonesia. PT Sinergi has the rights under a renewable Cooperation Agreement (the "Agreement") to produce oil from existing shut-in oil wells in the working area. Following the recent site reconnaissance visit by Rift Basin's technical team, and assessment of the technical, economic, legal and regulatory requirements associated with the exploitation of the Field, the new MOU seeks to formalize the renegotiated agreement whereby Rift Basin can now earn up to 70% interest in PT Sinergy by funding initial service and enhancement work. The renewal period underlying the Agreement will change to a specific term of 5 years for each period, for a total of 20 years, and provision is being made to segregate the obligations such that the Company is shielded from any direct or indirect environmental or human related liabilities associated the district-level cooperative's exploitation activities. In addition, the work commitment schedule will be modified in accordance with an independent third-party technical assessment and resulting recommendations, to be reviewed and mutually agreed upon between the Company and PT Sinergy. path to early cash flow that bypasses the usual exploration risk is a strategic coup with significant operational leverage. With shareholder support we should be able to progress quickly to realize on the potential." Since that announcement, the company is struggling to raise funds, raising $150,000 at 8-cents and trying to complete a further $350,000 through the issuance of 7 million units. But tellingly there's a reference to someone in the wings, with reference that"as part of the Technical Support Agreement, a minimum of $100,000 will be advanced to the Company by way of a non-brokered private placement to cover certain data access and due diligence efforts." This same August 13 press release of further stipulates that the company was "proceeding to acquire and evaluate a substantial volume of legacy seismic, technical and geological data with respect to the Indonesian onshore multi-reservoir oil field known as the Dandangilo & Beji Block ("the "Field"), being the initial project and subject of the Memorandum of Understanding referred to in the Company's announcement of June 5, 2013. This appraisal process will have the technical support of a technical team provided by an established intermediate oil and gas production company which will assist the Company to evaluate the economic potential for secondary shallow-oil recovery, as well as the deeper target potential in the basin (the "Technical Support Agreement"). "The Field has historic and current oil production. It is located in Bojonegoro, East Java, Indonesia, and contains 110 existing wells within an 80 sq.km. area. According to data on file at the University of Pembangunan Nasional Veteran, Jakarta, original oil in place in the Field reservoir was 112 million stock tank barrels ("MMSTB"). Pertamina recorded production of approximately 20 MMSTB during the period 1963-1980 after which no commercial operations were undertaken. The Company is seeking to confirm the Field's secondary recovery potential from more than 86 shallow wells after the application of relatively low cost well work-over techniques. In addition to the secondary recovery opportunity, the Company will be seeking to determine the deeper target potential below the Field's originally produced reservoirs. Elsewhere in the same geologic basin, ExxonMobil is reported to have discovered a very substantial oil accumulation at the deeper Kujung horizon in its Cepu Block, approximately 15km to the south of the Field and initial reports suggest the Cepu field is expected to produce 165,000 barrels of oil per day when fully developed." "Exxon has faced a host of problems developing Cepu, Indonesia's biggest oil and gas find in the last decade, culminating in the regulator's decision earlier this year to replace the company's local CEO. The drilling programme, which includes 25 new wells, will boost output to around 110,000 barrels per day by July 2014, peaking at 165,000 bpd in October that year, Elan Biantoro, a spokesman for industry regulator SKKMigas, told Reuters by phone. That compares with between 24,000 and 26,000 bpd now." The press release of August 13 also bore the less than positive news that Rift Basin had down-listed to the NEX board, which is essentially for non-active companies still seeking a project, which is understandable as they also officially withdrew from the Chorbane farmin. 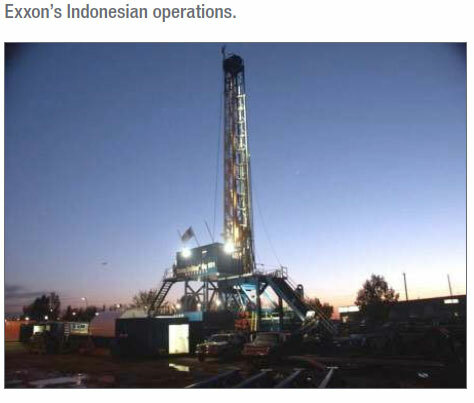 The company remains focused on the Indonesian opportunity, and intends to seek reinstatement on the TSX Venture as a Tier 2 oil and gas issuer once the MOU is replaced by a definitive agreement. Rift Basin is a text-book case of tenacity in the face of adversity, and stands in stark contrast to management teams who are throwing in the towel and walking away from their listed ventures as equity funders evaporate and sources of capital become extinct for exploration and early stage resource plays.